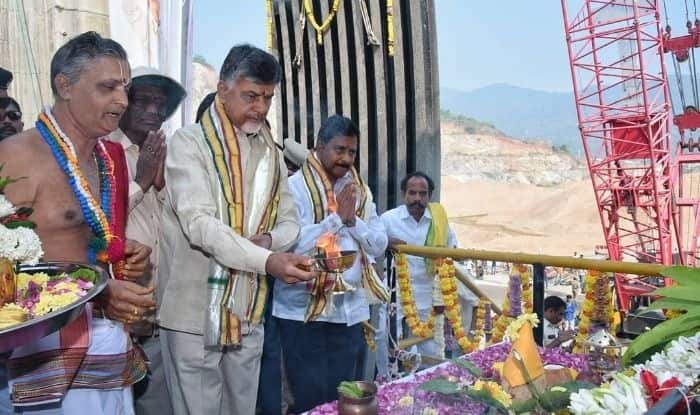 The lifeline of Andhra Pradesh, the much awaited Polavaram Dam has reportedly broken a Guinness World Record for the largest continuous concrete pour within 24-hours. The project is touted as the lifeline of the state since it is expected to pull the state out of its existing water crisis. Weird as it might sound, the category ‘largest continuous concrete pour’ flashes on the Guinness World Records site when checked and the authorities from the Guinness World Records were present at the site since Sunday, capturing the progress of the work via drones. Earlier, a Dubai based Abdul Wahed Bin Shabib of RALS Contracting L.L.C and Alfa Eng. Consultant had held the record for pouring 21,580 m³ of cement in two days. Apart from winning this distinction in their kitty, the Polavaram multipurpose project bagged the Central Board of Irrigation and Power (CBIP) award for speedy execution. Expected to be completed in 2019 as per schedule by Navayuga Engineering, the dam has also faced criticism from various activists along with notoriety in a report in Down To Earth that found that almost 400,000 people could be adversely impacted due to the irrigation project. Expected to supply 7.32 TNC of drinking water to Visakhapatnam and 16.12 tmc of water for industrial purposes, as per the report by Indian Express, the Naidu government has already spent about Rs 15,380.97 crore on the multipurpose project of which Rs 6,727.26 crore has been reimbursed by the Centre.